Ḥazzan and composer; born Nov. 10, 1840, at Szobotist, Hungary. He received his early education in the religious school of the Vienna congregation under Dr. Henry Zirndorf, and then studied at the Realschule and the Teachers' Seminary and Conservatory of Music, Vienna. From the age of ten he sang in the choir of Solomon Sulzer, and in 1859 became assistant cantor in Fünfhaus, one of the suburbs of the Austrian capital; from 1863 to 1866 he was cantor at the Neusynagoge at Prague. 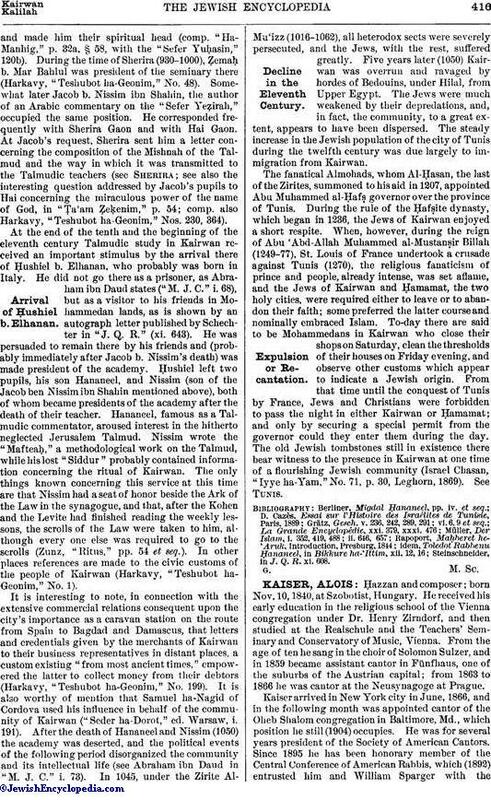 Kaiser arrived in New York city in June, 1866, and in the following month was appointed cantor of the Oheb Shalom congregation in Baltimore, Md., which position he still (1904) occupies. He was for several years president of the Society of American Cantors. Since 1895 he has been honorary member of the Central Conference of American Rabbis, which (1892) entrusted him and William Sparger with thecompilation of the musical portion of a Union Hymnal, published in 1897. 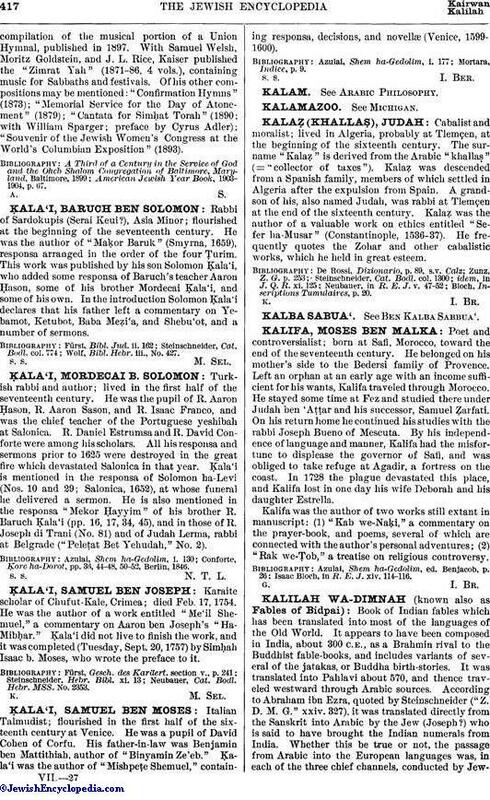 With Samuel Welsh, Moritz Goldstein, and J. L. Rice, Kaiser published the "Zimrat Yah" (1871-86, 4 vols. ), containing music for Sabbaths and festivals. Of his other compositions may be mentioned: "Confirmation Hymns" (1873); "Memorial Service for the Day of Atonement" (1879); "Cantata for Simḥat Torah" (1890; with William Sparger; preface by Cyrus Adler); "Souvenir of the Jewish Women's Congress at the World's Columbian Exposition" (1893). American Jewish Year Book, 1903-1904, p. 67.